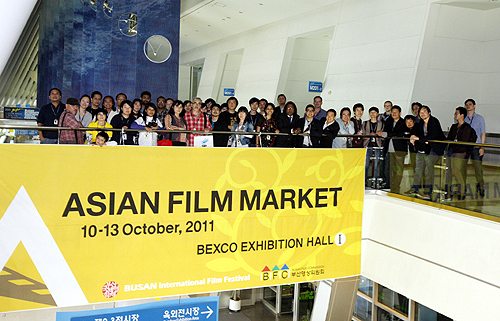 The 6th Asian Film Market 2011 closed last night after four days at its new venue, the BEXCO (the Busan Exhibition Convention Center). The market combined sales companies and BIFCOM locations and post-production services this year and saw an increase of 113% in exhibitors’ booths and 38% more participants than last year. 177 companies from 28 countries opened 109 booths. A total of 1080 badge holders from 585 companies in 42 countries came this year, up from 789 badge holders last year. The Asian Film Market had 33 market premieres, 11 more than last year. Market screenings increased from 39 films to 60, and 47 screenings to 64. Subsequently, the market increased their number of screens from four to six this year. For online screenings, 285 films were available to market badge holders, amongst which 151 were Busan International Film Festival (BIFF) titles. The Asian Project Market (APM), formerly known as the Pusan Promotion Plan (PPP), had 670 official meetings, up from 400 last year. Awards were also given out last night. The Busan Award went to director KUMAKIRI Kazuyoshi for his post-disaster project My Man – Watashino Otoko. The Kodak Award went to PARK Chan-kyong for his shamanistic horror film project When the Bell Rings Itself (working title) and the Göteborg International Film Festival Fund went to Shawkat Amin KORKI’s Memories on Stone and Abu Shahed EMON’s The Tale of a Policeman. The CJ Entertainment Award went to Carol LAI Miu-suet’s project Ocean of Love while the Lotte Award went to LEE Moo Young’s Last Confession and the Panstar Cruise Award went to Shivajee CHANDRABHUSHAN’s One More. This year’s Asian Film Market developed new programs such as the Korea Contents Fund Showcase and Talent Meeting in Busan where Korean talent agencies such as SM, YG, JYP, and Keyeast met with international filmmakers and companies such as China’s Huayi Brothers. At the KPIF Project Pitching, five works were in competition and Mystery of Hotel Prison (producer KIM Jeong-yeong) won the best pitching award. The film is a psychological thriller about the conflict between teachers and professors who are imprisoned in a motel and forced to prepare for the college entrance exams.